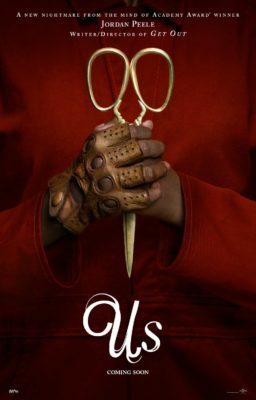 Jordan Peele has made two movies so far. The first being Get Out, a movie with such an impact on both viewers and society itself that it won an Oscar for Best Screenplay. Us, is his second and although interesting as a psychedelic movie, doesn’t compete with his first due to some problems with its script and pacing. Us follows a family that goes on vacation to a small cabin. They are soon tormented by their supposed doppelgangers who wish to take their place when the family soon realizes that it goes much further than anything they could imagine. The positives of Us do outweigh the negatives. Lupita Nyong’o plays both the mother of the family and her evil twin, and her performance is fantastic. She really captures the horror that comes from seeing your doppelganger and plays both characters so differently that they both feel very distinctive. The rest of the cast also did this, however, not as well as Nyong’o which does show in the film. The main concern comes with the fact that the plot would only work if it was a short horror story. And that’s a problem because it wasn’t advertised as such and isn’t depicted as such. When an audience goes in to see Get Out, they understand they’re watching a thriller with some sci-fi themes because that was the tone it was aiming for. Us feels more like it wants to be a commentary on something, but can’t figure out what. It also doesn’t help that it takes turns that, albeit interesting, devalues any sense of horror for an abnormal sci-fi piece. The shift isn’t justified. It can’t be eight different things while at the same time hoping that people will watch if some mediocre comedy is sprinkled around those eight things. If this was any other director, it’d be fine to just claim this as something to not think about and to turn your brain off. But the film has dialogue that suggests that it should be looked at in a critical fashion and you can’t be a trippy sci-fi anthology show while also wanting to be a social commentary without having the audience feeling overwhelmed. Us is a good movie and it deserves to be watched, however, it also doesn’t keep up a consistent theme and shifts so much it doesn’t feel focused, which does hurt the rewatchability of the film.